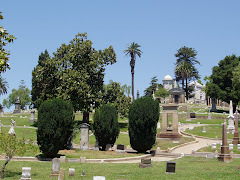 A few weeks ago I wrote about Roeding Park for my September 26th post. 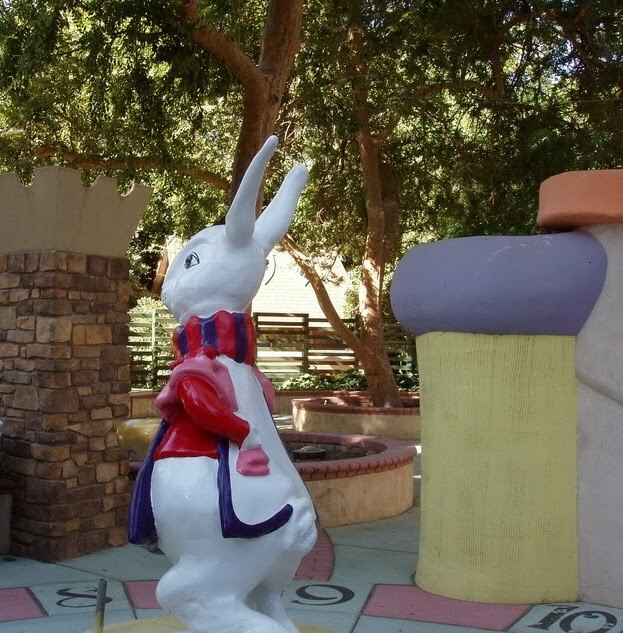 Today I want to focus on just one of the many features of this wonderful regional park – Storyland, which was a gift to the children of Fresno given by the Fresno Metropolitan Rotary in 1961. 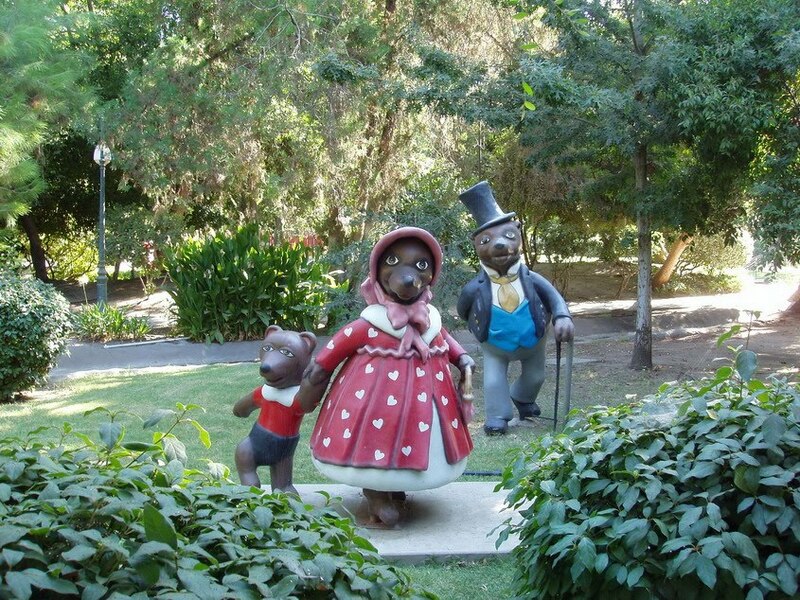 Storyland is now 49 years old and is a valuable contributor to our state’s cultural landscape. It would have been a strong contender in the national Theme Park Challenge initiated by the Northern California Chapter of the Historic American Landscapes Survey (HALS) and sponsored by the National Trust for Historic Preservation. Like Fairyland in Oakland, Storyland is a theme park for young children with exhibits based on familiar fairy tales. It is a richly stimulating environment with so many colorful and delightful elements that it can be overwhelming. Every detail is scaled to accommodate children – doorways are low, light standards short, benches and seats small, and pathways are narrow. Here adults have to stoop, bend down and crouch. There are at least 25 fairytale exhibits including Little Boy Blue, The Old Woman In The Shoe, The Crooked Man who Walked a Crooked Mile, Mother Goose, The Wicked Witch at Candyland, Jack and Jill, Goldilocks and the 3 Bears, Miss Muffett, Alice In Wonderland, Humpty Dumpty, and The 3 Little Pigs. There are at least two areas that families can rent for birthday parties or other special events. 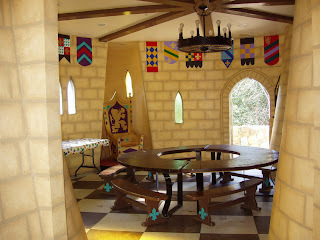 My favorite is the castle tower party room designed with a Camelot and Knights theme. Access to the castle is via a wooden draw bridge over the castle moat – beware of the sea serpent lurking in the moat near the bridge. 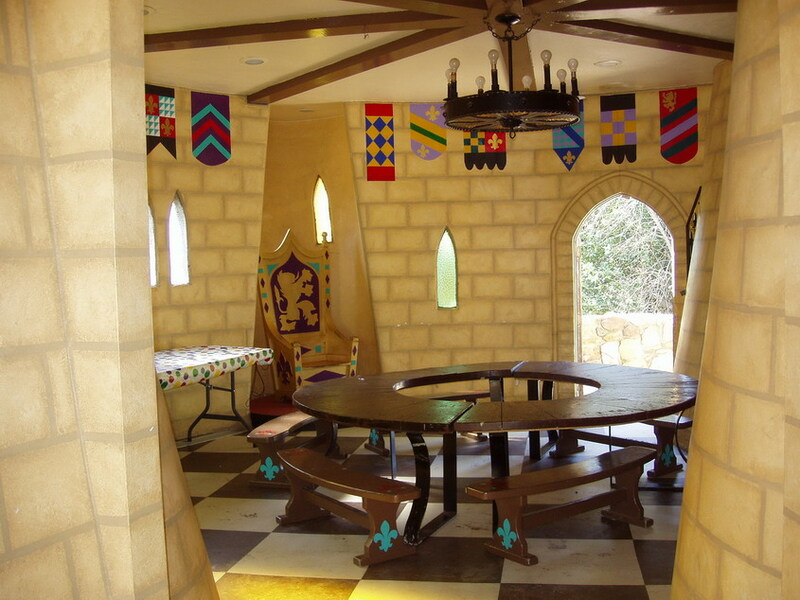 A narrow passage way leads into the Camelot room that has a circular table for the knights, painted stone interior, colorful hanging banners, and a tall, carved chair for the king or queen. The theme of the other party space is Alice In Wonderland where the White Rabbit presides at the entry and the 3 of Hearts stands guard. A large clock face is painted on the pavement and party tables are set inside a walled garden. But there is much more at Storyland to explore. The multi-masted Pirate ship with its giant wheel and elaborate riggings is unlike anything you could every find in any pre-manufactured play catalogue today. This realistically detailed structure includes carved ornamentation, cannons protruding from the sides, a coat of arms, a lantern for night sailing, slides, shoots and hiding cubbies, chains and robes, a sliding pole for quick escapes, and a carved dolphins masthead. 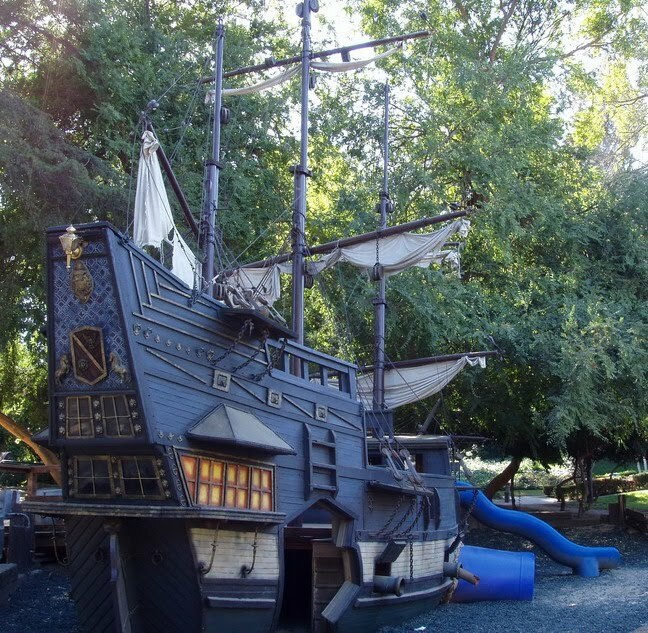 There is a child-size train that you board at the Storyland Train Station opposite the entry ticket booth, and then take a ride around Lake Washington where you’ll pass by a wrecked pirate ship and beneath the canopy of Roeding Park’s wonderful trees. There is a stage with seating for theater performances and puppet shows. There is even a small scale chapel with stain glass windows made with primary colors and miniature pews with inscriptions like, “The world rests on truth and peace”. Even the boys and girls restrooms are custom designed and scaled to accommodate children. The Tudor-style buildings enclose a brightly painted setting featuring the baker and boy with a goose – help me readers identify which fairytale this depicts – send a comment. 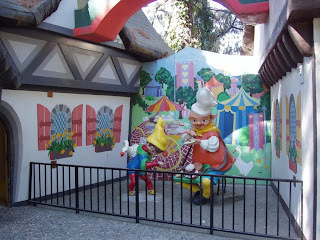 Storyland is laid out with curvilinear paths, of varying materials, colors and textures that lead to each of the exhibits. A man made, shallow, concrete-lined creek meanders through the site and at several spots one passes over a bridge to cross the creek. Each bridge is unique – one is a simple wood structure but others include bridges with colorful candy cane railings or gingerbread men. The best is an intricate, painted metal dragon with scales and loops on top. Small, themed tables and stools are found along the paths for picnics or snack stops. Of course each is unique. The one near the 3 bears looks like mushrooms and the table top is painted with daisies. There are two styles of brightly painted mushroom seats – one with a table, and many other small details tucked into every curve of the pathway. Storyland is worth a visit to Fresno if you have small children and for older children there is Playland with amusement rides, a water play area and another train. 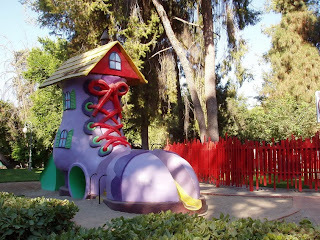 Of course there are other reasons to visit Fresno but Roeding Park is a must see for all ages. Thank you for sharing this! You piqued my interest! 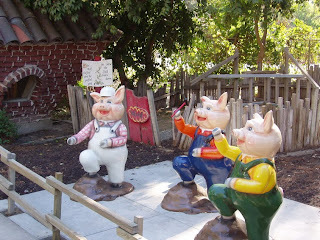 Having been born in the bay area and lived here all my life, I was not aware of Storyland! We have two small grandchildren we would love to take there now! Thank you so much! Thanks for your comment. After your visit let me know which fairytale the baker, boy and goose are from. i used to live in Fresno, born and raised. lived there for about 25 years... i might be wrong but i had always assumed those statues were from paddy cake paddy cake bakers man..
Well, thank you for solving this mystery. Clearly I am not sufficiently knowledgeable about fairy tales. Good to have the answer. loved your blog - i found it today when i googled for roeding park. 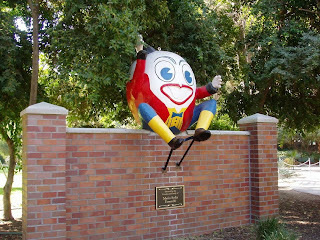 i was born & lived in Fresno in the 1960's and remember going to the park and Storyland when i was little. one of my favorite memories was sliding down a slide out of the Goldilocks and the 3 Bears cottage. If i remember correctly, of course! that's been a while. thanks for bringing up the fun memories. It seems that many have fond memories of Roeding Park. I never lived in Fresno but three generations of my family did and my Mother recalls my father taking her there while they were courting. Sad that a large area of the park will be taken when the city zoo expansion plan is realized.